This interesting and unusual name has two possible origins. The first is Anglo-Saxon and is a variant form of the locational surname 'Anmer', deriving from the place so called in Norfolk. The place is recorded in the Domesday Book of 1086 as 'Anemere', and means 'the duck mere', derived from the Old English pre 7th Century 'aened', duck, and 'mere', lake, mere. 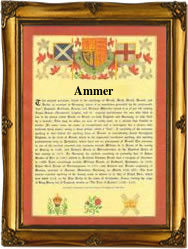 The second possible origin for the modern surname 'Ammer' is from a variant form of the early Medieval English occupational surname 'Amner', a contraction of the term 'almoner', a distributor of alms in a religious house or household. The surname from this source is first recorded in the Close Rolls of 1272 as John le Aumoner, and the derivation is from the Anglo-Norman French 'aumoner'. Robert Ammer and Susan Sparrow were married at Rede in Suffolk on August 20th 1628. The first recorded spelling of the family name is shown to be that of Alice Ammer (marriage to Richard Benstead), which was dated 1575, Hengrave, Suffolk, during the reign of Queen Elizabeth 1, 'Good Queen Bess', 1558-1603. Surnames became necessary when governments introduced personal taxation. In England this was known as Poll Tax. Throughout the centuries, surnames in every country have continued to "develop" often leading to astonishing variants of the original spelling.